Following a record injection via the medium-term lending facility yesterday, China's officials unveiled a set of policies designed to support the weakening economy that soon could face a substantial drag from US tariffs. The effort focuses on boosting domestic demand. Measures include targetted tax cuts and accelerating new infrastructure. This is a clear shift away from the deleveraging campaign, and it appears that the State Council dropped the "neutral" characterization of monetary policy. Chinese equities rallied. The Shanghai Composite rose 1.6% for a third consecutive rise. During which time, it is gained nearly 4.75%. Chinese shares that trade in Hong Kong rose 2.25%. It is the third day of gains as well. Chinese bonds weakened. 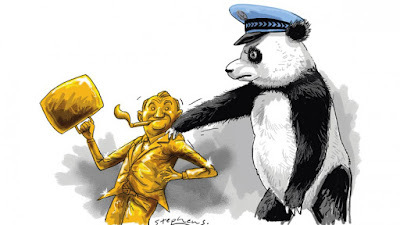 It seems to be partly a function of the shift in Chinese policies, but also part of the global movement. The 10-year bond yield rose five basis points to 3.57%, the high for July. Most Asian equity markets rallied. The MSCI Asia Pacific Index rose 0.65%. The beaten up KOSPI participated, gaining 0.5%, its largest gain in nearly two weeks. Foreign investors bought $165 mln of Korean shares, also the most in two-weeks offsets in full the sales this month. The solid performance in Asia has lifted the MSCI Emerging Market Index (+0.7%). It is near the upper end of this month's range. After selling off sharply over the past two sessions, Japanese Government Bonds stabilized today. The yield of the 10-year benchmark was little changed at a little more than seven basis points. Although the 40-year bond that Japan auctioned today saw demand more than three-times the supply, some expressed disappointment with the auction, which produced a slightly lower yield than anticipated. The poor flash manufacturing PMI (51.6 vs. 53.0 in June), the weakest since November 2016 underscores market suspicions that the BOJ wants to make its unorthodox policies orthodox, which means sustainable and minimize the squeeze on banks caused by the flat curve. At the same time, the volatile market reaction to even whiff of change spurred dramatic price action, and this may encourage the BOJ to bide its time at next week's meeting, with an eye toward the meeting at the end of October. The reaction in the currency market to these developments is mixed. The yen is flat to slightly stronger, consolidating its recent surge. The dollar has not yet managed to retrace even the minimal 38.2% of the drop spurred by Trump's comments, which is found near JPY111.65. There is an $850 mln option at JPY111.75 and $560 mln at JPY111.15 that expire today. The dollar was fixed higher against the yuan, and the dollar is at new highs for the move. The offshore yuan is the weakest in the Asian currency complex, falling 0.4%, nearly twice the decline of the onshore yuan. After the yuan, the Korean won was the weakest in Asia, easing 0.3% near the year's low. The main economic news from Europe came today in the form of the flash PMI readings. Other than the recovery in Germany manufacturing, the results are unlikely to please the ECB. The composite eurozone reading eased back to 54.3 from 54.9 in June. This puts it back near the low (54.1) seen in Q2, which was the lowest since Q4 16. Manufacturing edged higher (55.1 from 54.9), but services slipped to 54.4 from 55.2. Germany's composite reading rose to 55.2 from 54.8, a five month. The improvement in manufacturing (57.3 from 55.9 and the first rise this year, more than offset the slight decline in services (54.4 from 54.5). This was not the case in France. The composite eased (54.5 from 55.0) as the rise in manufacturing (53.1 from 52.5) was not enough to outweigh the decline in service activity (55.3 from 55.9). French manufacturing exports orders fell for the first time in two years. Nevertheless, Q2, which will be released next week is expected, to have increased by 0.4%-0.5%, which the ECB is likely to recognize as above trend. The start to Q3 is not spectacular but is unlikely to alter the ECB course of finishing its asset purchases at year-end. The lighter government issuance over the next several weeks may give the ECB's purchases more sway. That said, the 10-year Bund yield has pushed through the 40 bp mark for the first time since the June ECB meeting. Itlay's bond 10-year yield is near 2.70%, up five basis points on the session to near the July high, partly amid growing concerns Salvini wants to challenge the EU's budget rules while Finance Minister Tria is resisting. Recall last week that there reports that Tria was in dispute with Salvini over the leadership of the development bank. Meanwhile, Salvini's push for tax cuts and Di Maio's effort to boost benefits spending is leaving investors wary. The euro itself is in a quarter-cent range on either side of $1.1680. The extension of yesterday's pullback saw the euro ease toward the 61.8% retracement objective of the bounce from the $1.1575 level seen before Trump's comments, which is found near $1.1640. If that offers support a return toward $1.1750 would not surprise. There is an option at $1.1665 for one billion euros that expires today. Sterling is in a 30 point range around $1.3100 in quiet turnover. The Australian dollar is steady, just below $0.740, where an A$ 624 mln expiring option is struck. European stocks are enjoying a broad advance, helped by favorable earnings reports. The Dow Jones Stoxx 600 is up a little more than 1%. It has not closed a percent higher since June 22. It is at its best level since June 18. The DAX is leading the way, following a gap higher opening. The S&P 500 is called about slightly higher as it looks to extend the foothold above 2800. Markit reports US flash PMIs today but are unlikely to move the market. Tomorrow's new home sales, after disappointing housing data in the last few sessions, may be more interesting and the week's highlight, the first look at Q2 GDP is due out at the end of the week. Meanwhile, earnings season accelerates this week.